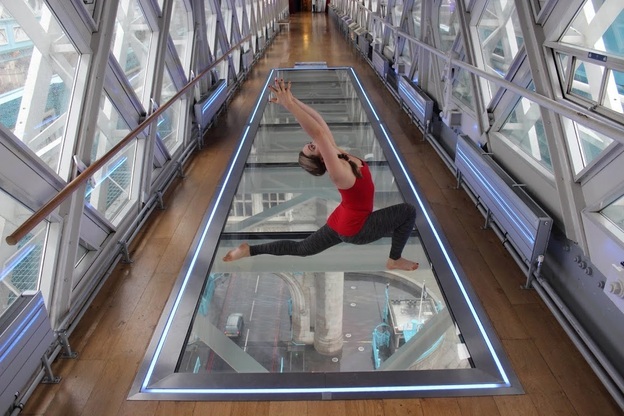 Tower Bridge Exhibition, one of London’s most iconic experiences, has announced an exclusive programme of yoga classes at Tower Bridge which will take place across the new glass floors, along its high-level Walkways giving unobstructed views over 130 feet up over the Thames. Beginning Monday 16th February 2015, London-based yoga teacher Billie Woodcraft will take vinyasa-flow yoga classes over the course of one month. Designed to revitalise and inject energy into Londoners with an exciting and never-seen-before view from the most famous bridge in the world, the yoga classes will allow participants of all abilities to perfect their practice whilst enjoying the river view suspended over the Thames, as well as road and pedestrian life – all moving at pace 42 metres/138ft below. Participating yogis may also have the possibility of witnessing the magic of the Bridge’s famous bascules raising for a river vessel – an experience not to be missed. The new glass floor across each Walkway comprises of six panels, each weighing 530 kilograms, supported by a carbon steel framework weighing approximately 1,000 kilograms, and designed to withstand the weight equivalent of one elephant and two London Black Cabs. The Walkways original steel lattice structure has been preserved under the glass. All class participants will be provided with mats. However to maximise the experience on the new glass floor, it is recommended to use gripped gloves and socks. I want to have yoga classes at Tower Bridge what are the dates?